Check out our calendar for upcoming Discover Scuba nights. For only $75.00 per person you can experience SCUBA diving first hand. After a 1/2 hour informative and entertaining video presentation you will get a full 45 minute SCUBA pool experience. It’s as simple as picking up the phone and booking your Discover Scuba. Once registered show up at our facility at 1737 York Avenue for your Discover Scuba with the following items: Bathing Suit, Towel, and Lock (for Lockers). We will provide all other equipment needed for your Discover Scuba pool experience. Discover Scuba is a PADI sanctioned program and is supervised by the experienced, professional & caring staff of Adventure Scuba. Discover Scuba is available once a month from Adventure Scuba. Check our calendar for the next Discover Scuba with Adventure Scuba. Learn to Dive Dry ! Emergency First Response, or EFR, is a course available to anyone interested in helping in an emergency. You will learn the proper techniques for 1-person CPR as well as basic first aid skills. This one night program is nationally recognized, and is a prerequisite for the Rescue Diver course. Price includes course material, video rental, and the PADI EFR Log. Home study is required so check our class calendar for an upcoming EFR class and call today to reserve your place. Complete your certification with us in local waters at Dutch Springs in PA. Learn to dive one on one ! The Rescue Diver Course is an important and critical step in expanding your knowledge and experience beyond a fully recreational approach to diving. The Rescue Diver Course teaches the student to look beyond himself or herself and to consider the well being and safety of fellow divers. It is for this reason the Rescue Diver course is a prerequisite to leadership level training (Divemaster, Assistant Instructor or Instructor ratings). The Rescue Diver Course like Adventure dives, Specialties and Advanced Open Water courses require the student to purchase course material and prepare at home prior to the in water portion of the program. Rescue Diver takes 1 night of pool training and then one Saturday at Dutch Springs to complete. Five scenarios performed over those days and workshops in rescue techniques round out the program. Successful completion of the Rescue Diver Course is one of the most rewarding in all the world of scuba training. The tuition for the Rescue Diver Course is only $350.00 and does not include course material or gear rental (if needed). Emergency First Response training is a prerequisite of the Rescue diver course. Check our calendar for upcoming Emergency First Response courses (if needed) and upcoming Rescue Diver training, contact us for availability & then stop by to purchase course materials or begin the on line academics using the link below and start your Rescue Diver training today. Learn to dive in a small personal setting. Scuba refresher / Reactivate is a one-night program designed for certified divers who quite frankly haven’t been diving lately. Program consist of an in water review of all of the skills of the Open Water Course. Adventure Scuba includes the use of our Regulators, BC Jackets, Tanks, Weights and Weight belts. Student must provide their own personal gear. (Mask, Snorkel and Fins) Wet suits are not required but suggested. Adventure Scuba also offers Snorkeling Classes in the same pools we use for SCUBA training. Many people participate in snorkeling but few have had any formal training in the proper techniques for snorkeling. Program covers both theory and practical application in the following: hyperventilation, snorkel clearing, mask defogging, gear preparation, swimming with fins and free diving. Classes are available any Tuesday or Thursday from the hours of 6:30 to 9:00pm. Tuition is only $159.99 per person. Rental of Mask, Snorkel and Fins are available. A discount off tuition is available for anyone purchasing Mask, Snorkel and Fins for an upcoming vacation. Call or come by to learn more and sign up today! 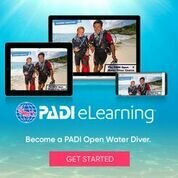 Learn to dive with us !